Two weeks ago I posted a Vine video I created of my students going around our school to complete an “Amazing Race” style activity to complete six different activities related to our reading of To Kill a Mockingbird. A handful of people tweeted me and asked me to share the activity. I am a big proponent of of learning stations and I wanted to put a spin on learning stations by making these activities a competition among students and setting up the stations around the school using clues related to the novel. For example, one clue read Scout said, “Until I feared I would lose it, I never loved to read.” Where can Scout fuel her passion for reading? Here is where you can find the next task on your TKAM Amazing Race. Each group of students were given a map with QR codes that led them around the school to then complete the text based activities. Each team got an answer record sheet and used their mobile devices to read the QR Codes and required readings at the different stations. All required readings were linked via QR codes but I have linked the articles below for my readers. Below are the six activities I asked my students to complete throughout the two day “Amazing Race” competition. Answer 3 questions to make a tic-tac-toe win. Write your responses on the answer sheet provided and bring to class completed. Read through the article “Growing Up Female in the 1930s South.” Think about what connections you can make between women interviewed and the women in TKAM. Complete the compare/contrast foldable in your Interactive English Notebook identifying similarities and differences between the gender expectations for women during this time period and Scout’s struggle to meet the gender expectations. A social structure in which classes are determined by heredity. Caste systems, social inequalities, and poverty cycles are all sub stories in TKAM. Throughout the book there are divisions in social classes which cause tension and conflict. What is the hierarchy in Maycomb County? Complete the chart on your answer sheet by placing where you think each of the characters belong. Then, find evidence to support your claim. Use your text to examine the conversation between Jem, Scout, and Calpurnia at the end of Chapter 12. Respond to the following questions, using quotes from the novel to help explain your responses. A) How do Scout and Jem describe the way Calpurnia uses language in church? B) What explanation does Calpurnia give for using language differently at church than in the Finch’s home? Who shows courage in the novel? Complete the chart on your answer sheet illustrating two characters who exemplify courage, how they show courage, and specific textual evidence that supports your claim. Find three people (Young people or adults) who can tell you the important life lessons they remember from the novel, To Kill a Mockingbird. Video record on your phone, this person talking about their memories about the book and the important life lessons they took away from the novel. If you would like a copy of my activity with the answer record sheet and QR Code maps for each group, please email me or leave a comment on my blog and I will share the document with you. Please note that the clues I created for my students were specific to my school. In my English classes this week my students are reviewing figurative language and literary devices as presented in O. Henry’s short stories. I created a figurative language QR Code Quest to help my students understand and articulate examples of figurative language in popular culture. The idea was that if students can identify hyperbole, metaphors, similes, allusion, alliteration, idioms, onomatopoeia, and personification in popular culture, they might be able to do the same with a piece of literature. Ideally, I want my students to identify and explain the figurative language, and distinguish how the author conveys meaning through the use of figurative language. If you haven’t heard of a QR Code or QR Code Quest, a QR Code Quest is a fun way to utilize mobile devices and send students off on a digital scavenger hunt answering clues. A QR Code, similar to a bar code, stands for “Quick Response Code” and is readable on Smart phones. The black and white squares link to a website. The QR Code quest includes words, images, and music to help students understand that figurative language is in all of these mediums. You can download a copy of this figurative language QR Code Quest for free here. I had the opportunity to present at the Rock and Roll Hall of Fame Summer Institute this week. The summer institute includes a week long professional development opportunity I highly recommend. The objectives of the institute include: (1) learning about the history of rock and roll and popular music, recognizing that music is the complex product of individual artistic creation, social and cultural communities, new technologies and emerging industries; (2) identify aspects of popular music culture that can be brought into the classroom in order to reinforce instructional goals, including meeting state and common core learning standards; and (3) plan classroom activities using featured Rock and Roll Music Hall of Fame and Museum content and resources. Below is my presentations and the resources I shared with the participants. 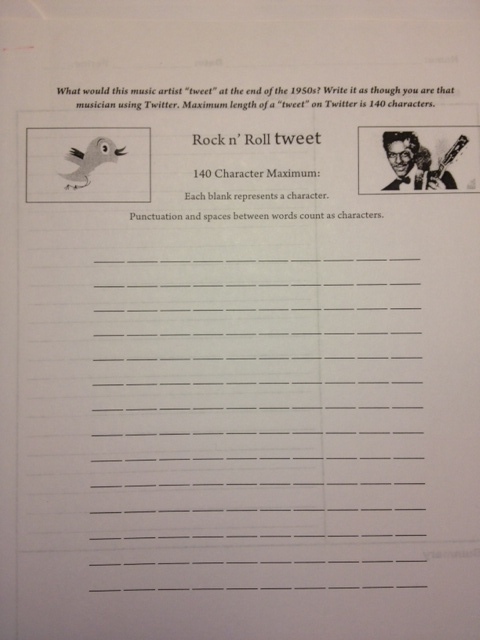 With this activity students have viewed Time Life’s History of Rock and Roll documentary. I have students take notes in their rock journal of the big ideas presented in the documentary. At the end of the first episode, the video discusses how within a few years of the late 1950s rock and roll exploded in the mainstream and then hit some speed bumps — Elvis was drafted into the military, Buddy Holly’s plane crash, Jerry Lee Lewis and Chuck Berry had some legal issues due to their relationship with young women — this Rock and Roll Tweet activity allows students to infer and synthesize based on their understanding of the documentary. Roll the Dice is a differentiated jigsaw activity that allows students to collaborate and answer questions generated by the teacher. 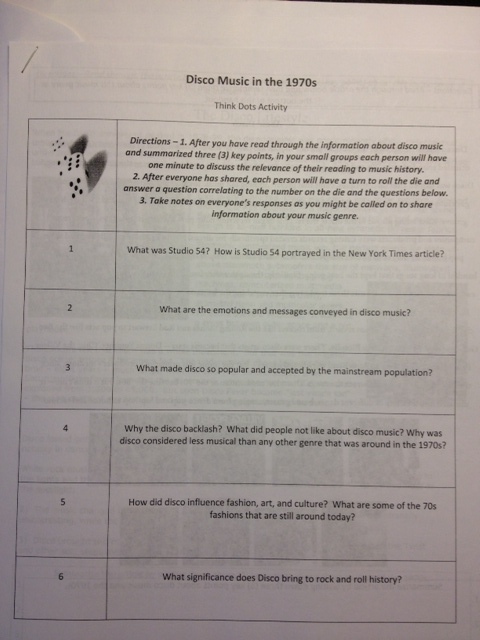 As students walk into the classroom they get the handout above with questions on one side and a particular reading about Disco on the other side. There are four different readings all about the history of Disco that range in reading complexity and sub topics. Students take the first ten minutes of class to read and summarize the reading. Then, students get into small groups with students who have the same readings and articulate their understanding. After six or seven minutes the students then break up into a second small group that includes students who read each of the four different texts. The students get a set of dice and each student has a chance to roll the dice and answer the question (with their peer’s help) that correlates to the number they rolled. A collaborative activity that allows students to work together, listen, and articulate their understandings. Additional materials shared is available on my Rock Write Listen Wiki. This includes a 1969 Woodstock QR Code Quest and Webquest about the 1980s. A special thank you to Stephanie Heriger and Max Espinosa of the Rock and Roll Hall of Fame and Museum Education Department for the opportunity to present and share lesson ideas I am passionate about.